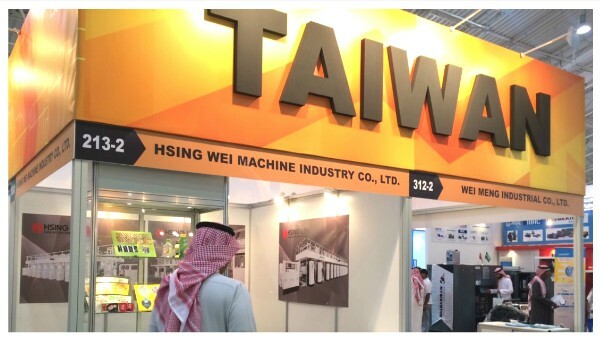 In order to opening overseas market and providing more support for customers, Hsing Wei Machine will attend in 2016 Saudi PPPP exhibition. It's a good chance for us to communicate face to face with customers,and you will know Hsing Wei Machine quality and service directly. The world's largest oil producers - Saudi-Arabia has been actively fostering rubber and plastic industry, upcoming on the 18th January, " Saudi Plastics & Petrochem, Print & Pack 2016"
Hsing Wei, rotogravure printing machine manufacturer, plastic material printing machines, flexible packaging equipment, and related manufacturers will participate. Taiwan has plastic material printing machines supply chain to combine industry manufacturers together, provide customers a wide selection of printing machines. Not only the number of participating firms highs, an exhibition area of ​​up to 648 square meters, up to the most, one of the largest exhibition scale based pavilion; global manufacture of flexible packaging printing machines, plastic material printing machinery such as Germany, Italy, Austria, group of countries participating in the exhibition. The exhibition will be hold on the 18-21 January,2016 at Riyadh International Convention and Exhibition Centre (Riyadh International Exhibition & Convention Center). As Saudi Arabia’s the largest and highest professional plastic rubber industry exhibition and get Ufi certified. Organizers of Riyadh Exhibitions Company, said this year will be continuing of the previous scale, attracting from 26 countries, more than 500 exhibitors had registered, and is expected to have more than 21,000 professional buyers to visit. Saudi Print & Pack is the Kingdom’s number 1 trade fair for the print, pack and sign media industry showcasing brand-new formats and cross-media concepts. Over the past years, the show continued to raise the standards of the printing and packaging industries by providing the top rated service, convenience and knowledge in all aspects of both industries. The show is the largest and the longest running event in the region, attracting both exhibitors and visitors from across the world to a market with real growth opportunities. Hsing Wei machine look forward to welcoming you at Saudi Print & Pack - Riyadh 2016!